Ella Fitzgerald was born on April, 25, 1917, to a single mother – her father's identity is unknown. She grew up in a poor, cosmopolitan neighborhood in the New York suburbs and, at 15, she moved to her aunt's in Harlem after her mother passed away. A dance and music buff, she won an amateur performance competition in 1934 at the Apollo Theater in Harlem, which is how drummer and conductor Chick Webb noticed her, and hired her as a singer in his big band – whose mascot and star she became presently, as they recorded numerous hits such as “Mr Paganini” in 1936 and, in 1938, “A-Tisket A-Tasket” - which remained her signature theme for years. 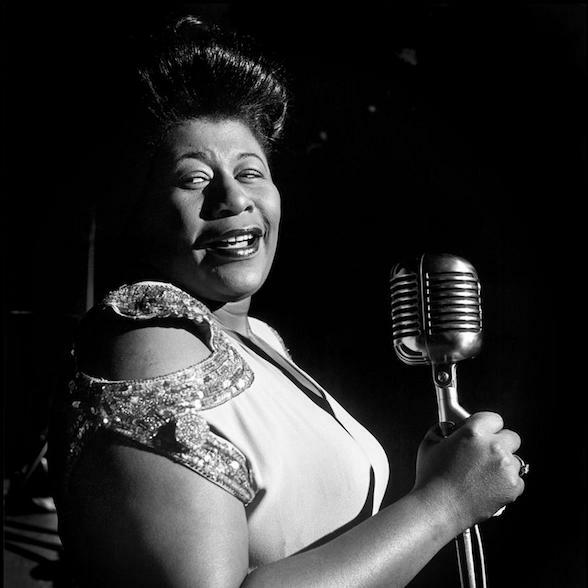 After Webb died in 1939, the young 22 year-old singer took on the band's lead, and renamed it “Ella and her Famous Orchestra” - however, big bands gradually went out of style and the formation broke up in 1942. She then started numerous collaborations with vocal ensembles and fashionable personalities such as singer and saxophone player Louis Jordan: her brilliant solo career allowed her to dash back to the top of the charts. At the same time, she started singing in Dizzy Gillespie's great be-bop orchestra, and in this modernist context she displayed exceptional improvisational gifts, further transcended by immense technical virtuosity. In 1946 she started taking part in the Jazz At The Philarmonic Tours; the organizer Norman Granz became her manager. In 1955, largely to promote the universal genius of the singer, Granz founded his label Verve, and Ella started her mythical recordings, soon becoming a genuinely international star. After three records with Louis Armstrong (including a breathtaking version of “Porgy and Bess”), Ella became the legend she is by revisiting in her own style the great American repertoire (Cole Porter, Richard Rodgers and Lorenz Hart, Duke Ellington, Irving Berlin, George and Ira Gershwin, Harold Arlen, Jerome Kern, and Jonny Mercer). These eight records were brilliantly “staged” by the greatest arrangers of the time and released from 1956 and 1964; the series is called “Songbooks” – undeniably one of the jewels of her discography. She reached a much wider audience than mere jazz lovers, partly thanks to the prestigious prizes and awards she won over time (four Grammys as “Best Female Pop Vocal Performance” between 1959 and 1963!). In the mid-1960s, the “First Lady of Song” was at the height of her success, in the United States where she regularly appeared on TV shows, thus becoming a household name, and worldwide where her concerts were systematically sold-out. In 1967 the Grammy Academy crowned her with a “Lifetime Achievement Award”, recognizing her lifelong dedication to music. Even when jazz started losing parts of its audience to rock and pop music, Ella Fitzgerald, who went for a while without a record label, remained enduringly focused on giving quality performances; in the early 1970s she met guitar player Joe Pass – the perfect accomplice for the last – and most soulful – part of her career. She remained very active on stage despite crippling diabetes-related health issues, and in 1987 she received from President Reagan the National Medal of Arts, and officially became a “National Treasure”. In 1991, she performed for the 26th time at the prestigious New York Carnegie Hall. This was to be her last public appearance. Her diabetes took a turn for the worst, nearly blinding her. In 1993, both her legs had to be amputated. She died in Beverly Hills on June 15, 1996, surrounded by her family.